Hot Isostatic Pressing (HIP), or 'Hipping', is the simultaneous application of heat and high pressure to materials. This process is ideal to improve and repair a casting, or to deliver powder metallurgy components. A HIP unit consists of a high temperature furnace enclosed within a pressure vessel. Castings or Powdered Metals in a CAN (the work pieces) are heated under a uniform, isostatic pressure of inert Argon gas. This process repairs castings that have both visible and invisible adverse properties. Following Hipping, the result is elimination of internal voids (i.e. porosity) and improved microstructure. The casting will be hugely improved after this process. HIP is effective with almost all materials – including metals, ceramics and plastics. HIP repaired castings have all of the porosity removed. The reduced porosity of HIP’ed materials enables improved mechanical properties such as fatigue strength and increased workability. The HIP process densifies and repairs and creates a clean uniform microstructure of the casting. Examination of HIPPED parts by non destructive testing techniques show excellent results. These characteristics are not possible with welding or casting. In Powder Metallurgy, the HIP process can produce materials from metallic compositions that are difficult or impossible to forge or cast. 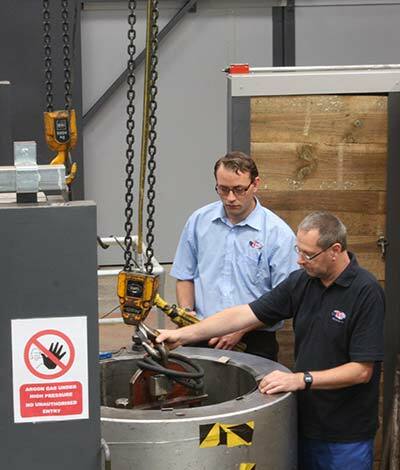 Working with important and nationally accredited academic institutions, we are developing new technologies which deliver significant benefits for large manufacturers of components. Talk with us about our innovative approach to Near Net Technologies.